I used to head down to Blyth to go to the “Rubber Boot” (The Blyth Inn) and sing karaoke and have a few drinks with my friends. In the past four or five years I have gone to the Blyth Inn to have great large portioned gourmet meals. 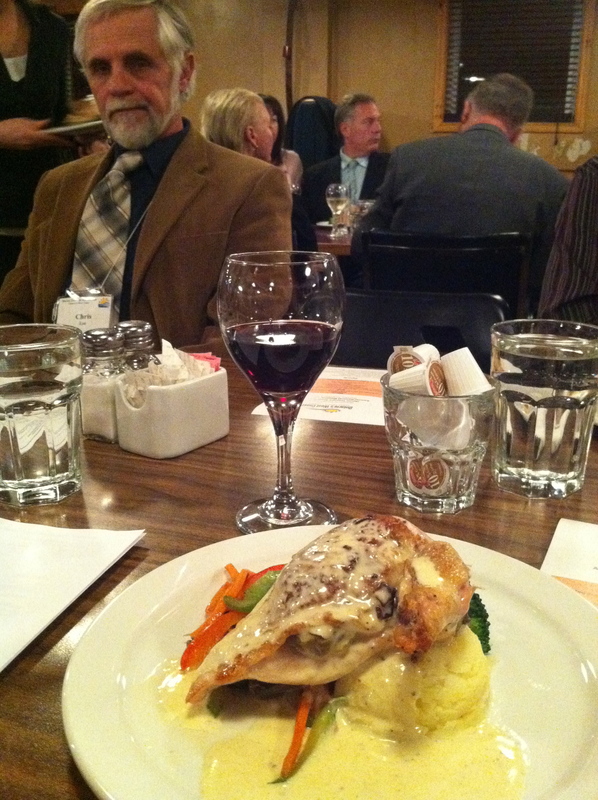 Last week was the Huron Tourism Association Annual General Meeting and Fall dinner. This is an annual meeting where members network and chat about the year, but of course the main part of the evening is dinner. 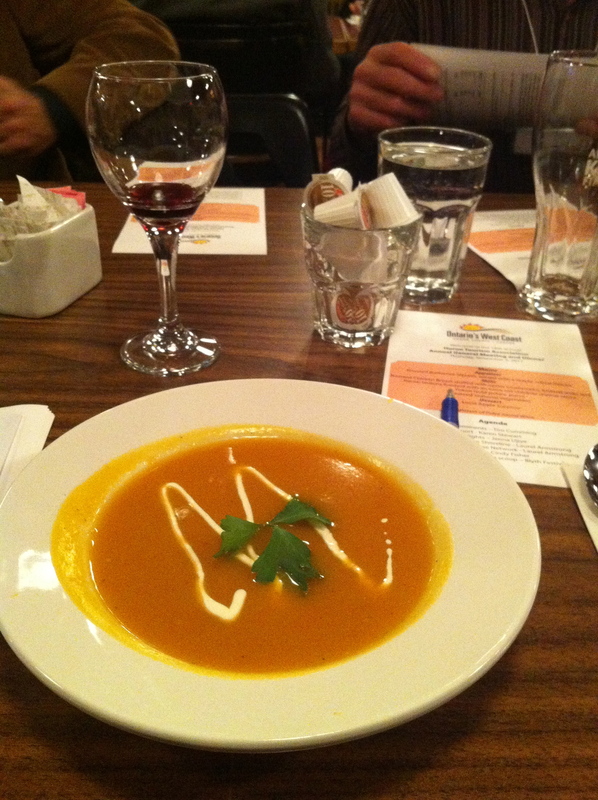 We started off the night with Roasted Butternut Squash, served with a maple crème fraiche. What a delightful soup to have on a cool fall day! The main course was Roasted Chicken Breast stuffed with oyster mushrooms, braised leeks and bacon lardons finished with an extra old cheddar cheese sauce with yukon gold potato puree and Sauteed seasonal vegetables. Another autumn themed course, delicious. 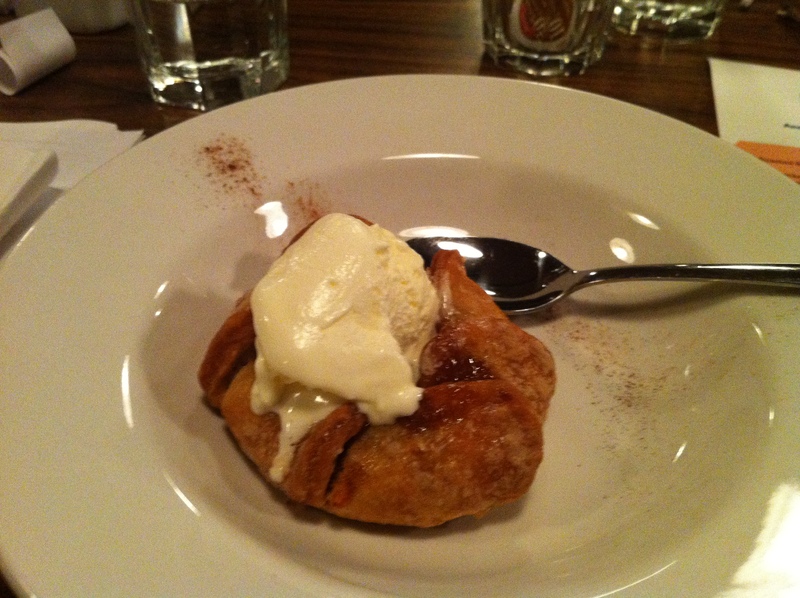 For dessert we had a Local Apple Surprise – it was apples baked in pastry with vanilla ice cream, sooo good! Of course Pelee Island Wines were served with the courses! I was sitting with my friends Chris and Judy Lee (their daughter in law is one of the owners!) and they were telling me that on different occasions throughout the year their son brings in wild game and cooks it with chef Jason Rutledge. I am a big fan of trying different cuts and types of game, so I asked them to tell me the next time this happened, so I could check it out! I will make sure to write a blog post about it for sure! ← Had a great summer, I’m back to blogging!